BioPop’s solar-powered Dino Sphere. Credit: BioPop. Remember Sea Monkeys? Remember how disappointed you were when you found out they weren’t really humanoid organisms, but boring old brine shrimp? 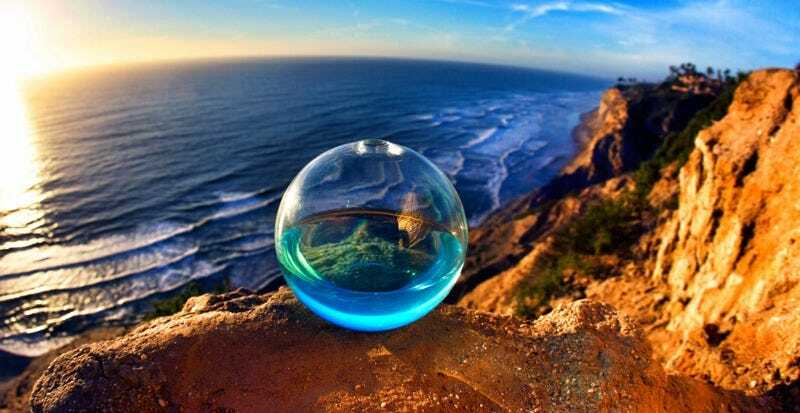 Now there’s a nifty alternative: the Dino Sphere, a decorative glass sphere that houses thousands of plankton. Swirl the sphere a little at night, and those plankton will emit a bright blue glow. In essence, it’s “an interactive living world,” with no need for batteries or electricity, according to BioPop, the San Diego-based company that created it. Yes, these are the same folks who brought you the bioluminescent Dino Pet in 2013. Both the Dino Sphere and Dino Pet get their glow from a phenomenon called bioluminescence. Bioluminescence really is pretty awesome. Large concentrations of bioluminescent bacteria are behind an ocean phenomenon called the “Milky Seas”: glowing white patches of sea water stretching across an expanse as large as Hawaii. Some algae have this ability, too. Other marine organisms—most notably, dinoflagellates—glow in response to some form of physical stimulation. When physically agitated, dinoflagellates give rise to the telltale sparkling wakes that get churned up behind boats at night, like those in the famed Bioluminescent Bay in Vieques, Puerto Rico. The Dino Sphere is reasonably affordable at $59.95. You can now pre-order one of your very own, for an expected June delivery.